HK (S97) is a 57-year-old man from Indonesia. Blood test showed that his CA 19.9 was elevated. A CT scan on 15 March 2011 in Singapore revealed a small right pleural effusion and small nodules in his right lung. Hypermetabolic primary tumour at the right lung apex. 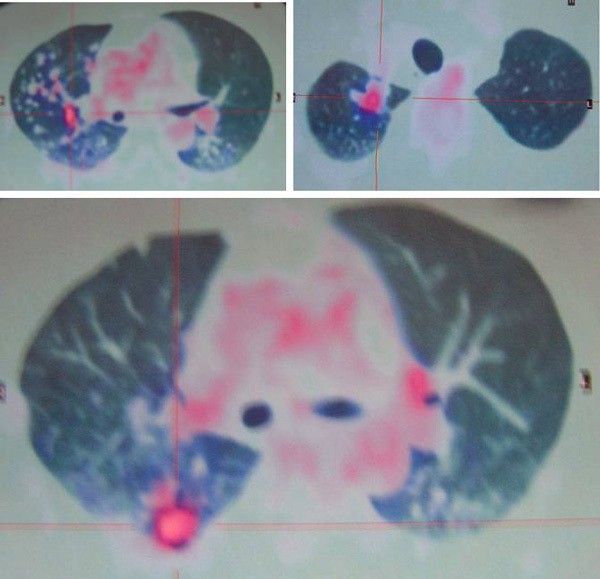 Smaller subcentimeter nodules (below the resolution of PET) in the right lung, suspicious for intrapulmonary metastases. Right pleural effusion with multiple FDG-avid pleural nodules. FDG-avid left supraclavicular, subcarinal and right paratracheal nodes, suspicious for nodal involvement. 19 March 2011 Biopsy at a hospital in Kuala Lumpur. 22 March 2011 Lung cancer confirmed. Study carefully the rise and fall of his CEA. From 85.5 it increased to 123.5 and then decreased to 64.2 after which it started to climb to 130.3 to 737.5. After CA Care’s herbs it went down to 629.8. Study carefully the rise and fall of his 19.9. It started with 435.9. With chemotherapy it decreased to 291.6, 164.8 and eventually 85.7. However with more treatment the CA 19.9 started to increase to 114.1, 438.2 and eventually 4,422.0. After CA Care’s herbs it went down to 3,609.0. When the CEA or CA 19.9 went down after chemotherapy, patient and his family were happy and the doctor surely is similarly happy and “believes” that the treatment has done the trick. But there is no cause for celebration because the decrease of CEA and CA 19.9 are just meaningless. It happens often – only that those concerned never want to see reality. They want to believe that chemotherapy is going to cure their cancer! In the case of HK above, again I say, the increase and decrease of his tumour markers is meaningless. At the end of the day, this is what his lung looked like. No use and no cure. Increase or decrease of CEA and CA 19.9 after chemotherapy is meaningless when the end results of the treatment are like these! This entry was posted in Advice to Patients, Lung Cancer, Medical treatments and tagged CA 19.9, CEA, chemotherapy, lung cancer by CA Care. Bookmark the permalink.